1. Son of Boaz by Ruth, the daughter of Naomi. He was named, curiously enough, by Naomi's neighbors, and not after his own kindred. Obed was the father of Jesse and the grandfather of David (Ruth iv. 17, 21, 22; I Chron. ii. 12). 2. 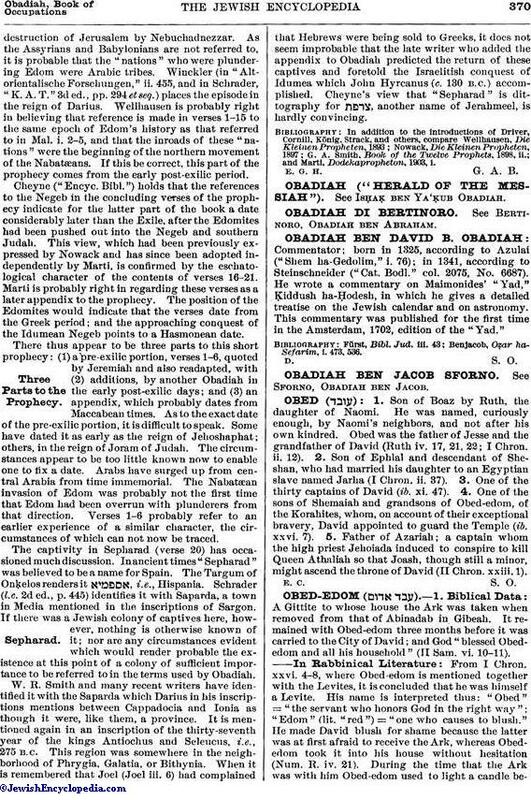 Son of Ephlal and descendant of Sheshan, who had married his daughter to an Egyptian slave named Jarha (I Chron. ii. 37). 3. One of the thirty captains of David (ib. xi. 47). 4. One of the sons of Shemaiah and grandsons of Obed-edom, of the Korahites, whom, on account of their exceptional bravery, David appointed to guard the Temple (ib. xxvi. 7). 5. Father of Azariah; a captain whom the high priest Jehoiada induced to conspire to kill Queen Athaliah so that Joash, though still a minor, might ascend the throne of David (II Chron. xxiii. 1).